Mallet note reading and performance are approached in a unique and revolutionary way that won’t overwhelm students with too much, too soon. Starting with Sound Rhythm: Level 1, students will learn only two to three notes at a time, each reinforced with interesting and engaging exercises. New notes will be systematically introduced and similarly reinforced, keeping students motivated while achieving retention. Once all the notes of each included scale have been taught and reinforced, the full scale will be presented, in its common form, for further practice and understanding. 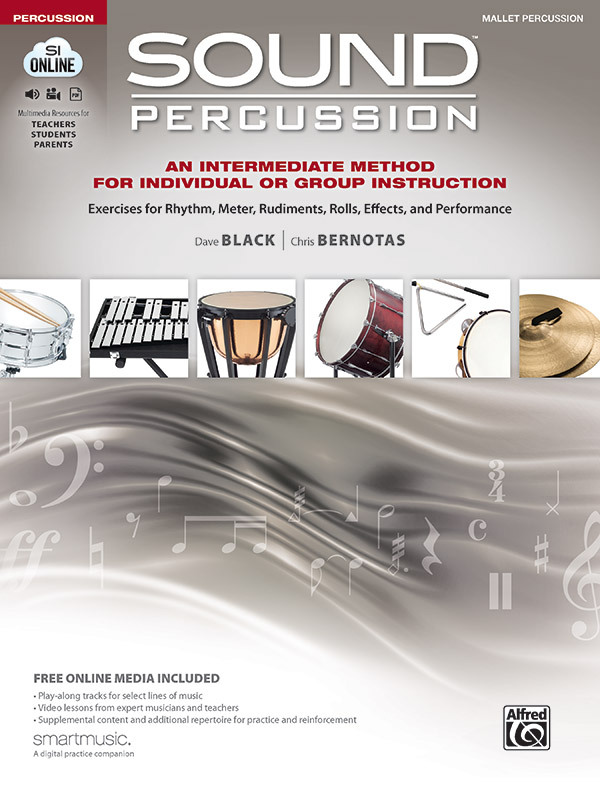 The Your Instrument section explains many of the different mallet instruments, their parts, setup, mallet selection, playing position, and more. In the Sound Rhythm section, new rhythms are introduced in unison (when appropriate), using notes that have already been learned. The isolation of the new concepts will ensure comprehension. Plenty of skill support is provided in the Sound Reinforcement sections immediately following each new concept. While those playing snare drum focus on the more advanced rudiments in the Sound Rudiments section, mallet players will learn how to apply and experiment with sticking patterns. Their focus is to find patterns that allow for the most musical and comfortable performance of their parts while supporting the rudimental study. The Sound Meters section introduces meters starting with simple duple meters first, followed by compound meters, then asymmetrical meters, helping students become prepared and confident for the last level that features changing meters. 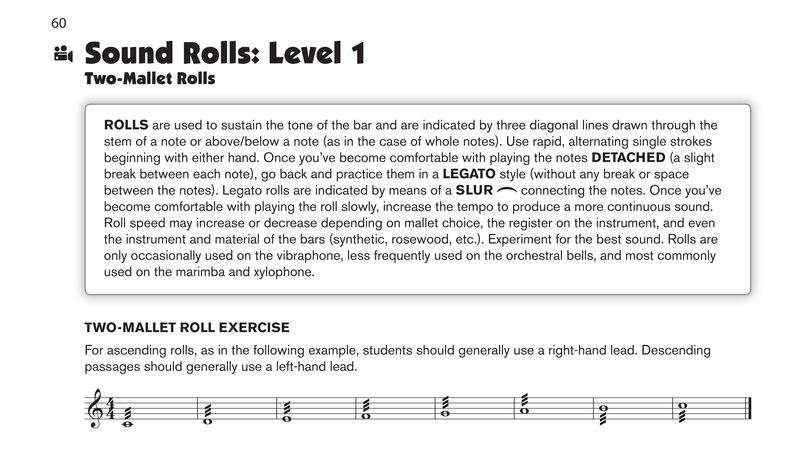 Sound Percussion's comprehensive mallet approach introduces students to both two- and four-mallet rolls in the Sound Rolls section. Clear illustrations and video demonstrations are provided to aid in better comprehension. Students are introduced to sound effects such as glissandos, tremolo effects, pitch bends, and more in the Sound Effects section. 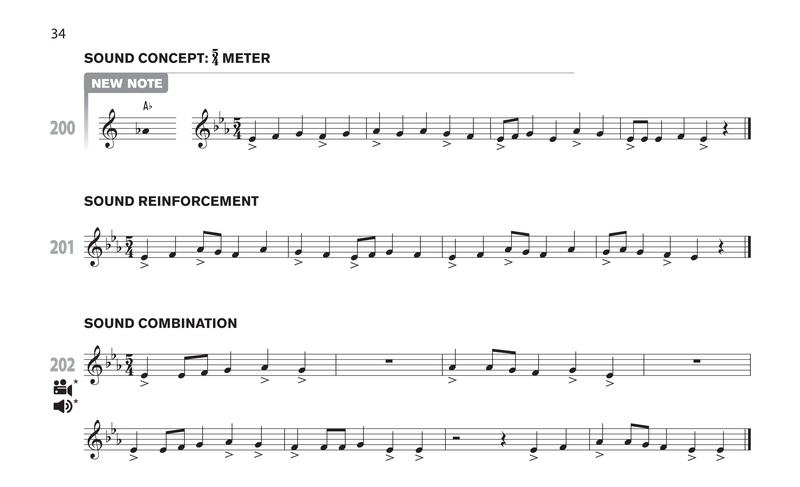 In order to aid in better comprehension, enharmonics and chromatic examples are presented in a clear and understandable way with reinforcement exercises immediately following.